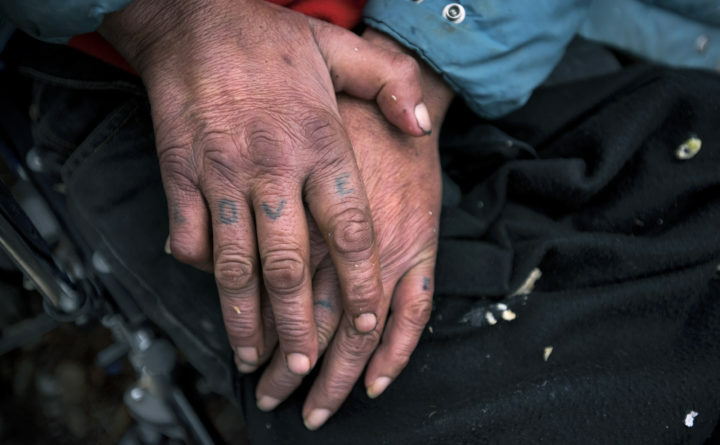 Larry Noyes' hands are pictured while he and his partner, Carolyn Fish, lived in the homeless encampment along the Penobscot River in Bangor in November 2017. Noyes died shortly after they were able to move into an apartment in Bangor during the summer of 2018. A Maine housing developer has received $350,000 from the federal government to build additional housing in the Bangor area in an effort that could nearly rid the city of long-term homelessness. The U.S. Department of Housing and Urban Development awarded the money to Community Housing of Maine, the state’s largest housing provider for people who were homeless, on Feb. 6, according to the organization’s director, Cullen Ryan. MaineHousing will provide a dollar-for-dollar match to cover the cost of construction, a spokeswoman said. The money will go toward constructing a four-unit apartment building for people who have been homeless for more than six months and will require tenants to receive case management services to help them stay housed. On the surface, it doesn’t seem like four new apartments will make much difference toward ending long-term homelessness. But, as of the most recent official count in July, only seven people in Bangor were homeless for more than six months. “We’re that close,” said Ryan, who also chairs Maine’s Statewide Homeless Council, a policy advisory group established by the Maine Legislature in 2005. The project will add fuel to an ongoing statewide effort to end chronic homelessness, and, according to Ryan, is a sign that Maine’s proven-to-work policies have positioned the state to compete for a limited pool of federal funding earmarked toward that effort. “Long-term stayers” tend to be homeless for long periods because of a disabling condition, such as an untreated mental illness or substance use disorder. Although they account for only about 1.3 percent of the people who experience homelessness in Maine, the chronic nature of their circumstances means they use a disproportionate amount of emergency services, such as shelter beds and hospital visits. That is both expensive for communities and traumatic for those with no permanent home. Since 2013, Maine policy leaders have prioritized help for this group, directing rental subsidies and case management services toward them first as part of a strategy to free up services for the majority and better serve a group that has been historically difficult to help. It’s working. As of July 2018, the number of single Mainers who were homeless for more than six months dropped from 262 to 63, according to the Statewide Homeless Council. This fiscal year, the federal government directed about $2 billion to support state housing programs, money that is the backbone of housing assistance programs and for which states compete every year. This year, in late January, Maine received around $12 million, which will mostly go toward renewing funding for programs. Community Housing of Maine’s project is one of just two programs that was approved for new funding; another $100,000 will fund a new program for victims of domestic violence. Five other new projects did not receive funding. Community Housing of Maine has not finalized a timeline for construction of the apartment building, which will likely be in walking distance from downtown Bangor. The new facility will be the organization’s fifth building in the area dedicated to people who were homeless, Ryan said.